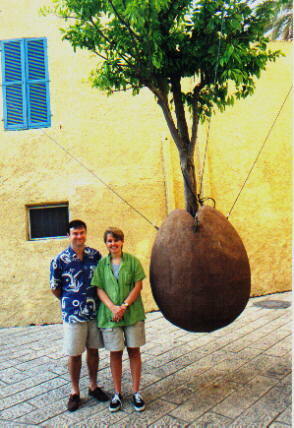 Jaffa or Joppa is a very old city located on the Mediterranean Sea about 30 miles NW of Jerusalem. It is now a thriving metropolis. 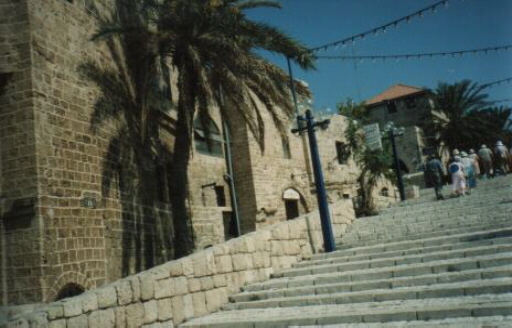 In Bible times Jaffa was called Joppa. Claiming to be the oldest port in the world Jaffa or Joppa or Yafa obtains it's name from the Hebrew word "beautiful." 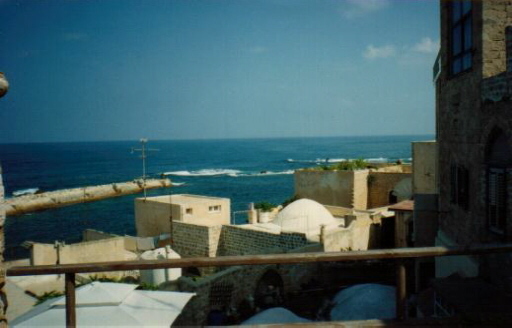 From Joppa, Jonah embarked on a boat to Tarshish (see Jonah 1 v 3). Peter undertook a miracle on Tabitha (when translated means Dorcas) (See Acts 9 v36) and saw the vision of the great sheet let down from heaven. (see Acts 10 v5 & 16). We also learn from the Bible that Peter stayed at the house of Simon the Tanner. The city was destroyed by the Romans and changed hands several times during the crusades. In the 19th century the Turks built much of what is today's Old Jaffa... a colourful "artists" colony. See first photo. In 1906 sixty Jewish families left the old Jaffa to build homes in the northern sand dunes, now called Tel Aviv, that is "Hill of Spring." On 14 May 1948 David Ben Gurion proclaimed the birth of the nation Israel from Tel Aviv. Sadly the next day the Arab world declared war on Israel.